Ernie Els has been one of the top professional players in the world since the mid-1990s. A former World No. 1, he is known as "The Big Easy" due to his imposing physical stature along with his fluid, seemingly effortless golf swing. Among his numerous victories are three major championships: the U.S. Open in 1994 at the Oakmont Country Club and 1997 at the Congressional Country Club, and the The Open Championship in 2002 at Muirfield. 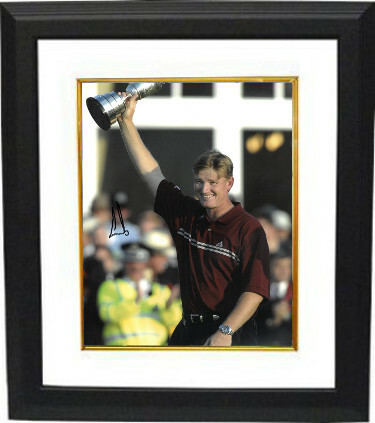 Ernie Els has hand autographed this 11x14 Photo his win at the 2002 Open Championship. Certificate of Authenticity from Athlon Sports Collectibles. Custom White Mat and Premium Black Frame as shown.